Credit: NASA/JPL-Caltech (view JPL Image Use Policy). Download this movie (MP4, 21.9 MB). [01-Mar-16] SWOT will collect data across a 120 km wide swath, with a gap in the center for an altimetry track. 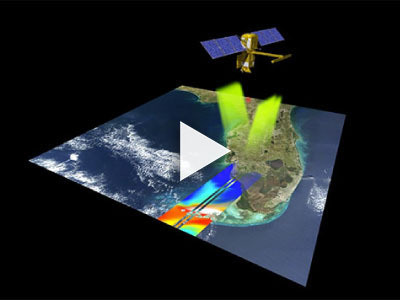 This animation shows the collection of data over the state of Florida, which is rich with rivers, lakes and wetlands. Globally, measurements will be taken both over the ocean and over freshwater areas.